I began to do stained glass work part-time in 1983, using the copper foil technique. I was self-taught, and have been innovative from the beginning with respect to both design and technique. 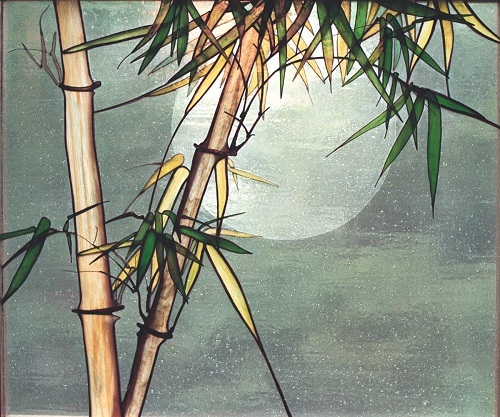 Towards the end of 1984 I made my first window: “Bamboo”. I have made a few lamps and other objects in stained glass, but most of my effort is expended creating windows. I think of the process as similar to painting: exploring form, color and light. Windows give me greater opportunity to do this. More recently, I have combined stained glass with carved wood and bronze in sculptural work. In my earlier career I was a university teacher and researcher in the field of Information Science. I have a Bachelor of Arts degree in Mathematics from the University of Durham, England. In my first three jobs, beginning shortly before college in 1963, I was employed as a computer programmer. Computing has been a part of both my graduate education and my work ever since. I have a Master of Science degree from Durham in Computing and a Ph.D in Information Retrieval from the University of Newcastle-upon-Tyne, England. I taught college students at all levels, and contributed quite a few research papers to the academic literature on Information Retrieval. I resigned my Full Professorship at Syracuse University in May 1997 to devote myself to creating stained glass art. I began to discover the potential of stained glass as an artistic medium for myself about two years after moving (in 1981) to Syracuse, New York. Interestingly enough, my experiences in computing and in stained glass are not entirely unrelated (at least, in my mind.) Programming computers to interact with people in comfortable ways was very different in my graduate student days from what it is now – our tools were much simpler – and part of the pleasure for me was to see sometimes quite smart program behavior emerge out of the mass of intricate detail that we had to code. I get a similar thrill out of seeing a desired visual effect, or a whole picture, emerge from the assembly of a multitude of painstakingly chosen and shaped small pieces of glass. 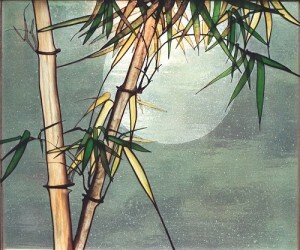 If you do it right, the viewer does not “see” the individual pieces. Most of my stained glass work has been commissioned for private dwellings. I have developed a distinctive range of styles and techniques in response to the needs of my clients. In recent years, I have shared some of my personal experience in stained glass art through a series of articles (with patterns) in the magazine Glass Patterns Quarterly, in articles in other magazines, including Glass Craftsman and Glass Art, and through occasional intensive weekend workshops.